The rapid influx of innovative technologies like voice searches, AI, Chatbots etc have altered the traditional content marketing approach. However, what remains unaltered is the need to create high quality and relevant content. Revamping your entire content strategy may seem overwhelming but we’ve got a simpler alternative for it- HubSpot Content Strategy Tool! It improves your SEO experience, enhances user experience and enables you to identify gaps in your content marketing strategy. You can now create topic clusters based on your ongoing content marketing strategy. This new tool helps you to focus on your marketing approach by providing suggestions for topics based on your current website content and domain. It’s much easier to fine-tune your ongoing strategy with a few tweaks here and there than starting from ground zero. It helps you sort and organize content ideas by grouping content into different categories called topic clusters. It’s made up of a core topic or Pillar Page and a number of related subtopics. HubSpot’s tool suggests core topics based on your existing website content to get you started. You can also choose to create your own core topic. This may be a way to test new core topics you’re looking to target. Core topics and subtopics suggested in HubSpot will be “validated” to determine whether they are relevant or not. This can be helpful when testing out new topics to see how they fare against your current content benchmarks. 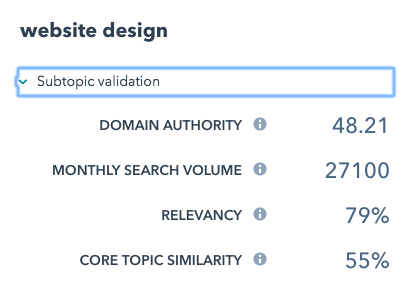 Validated topics can be examined in detail to view key metrics such as domain authority, relevancy, monthly search volume and similarity to the core topic. These metrics denote how likely it is that someone searching for a topic similar to what you’ve written, will find what they need from your current content. Once you’ve set up your topic cluster, you can review the same through a simple, user-friendly dashboard. Here you can view the sessions, contacts and customers influenced by your content, and update your content strategy accordingly. By using topic clusters, you can keep your content streamlined to exactly what your potential customers are searching for. The content strategy tool is useful for researching and testing new content ideas, but be sure to track progress using the campaign tool for actual ROI. With HubSpot’s campaign tool, you can track which campaigns (or core topics) drive traffic to your site. Your content strategy should not only focus on creating new content pieces because eventually you will run out of ideas. Rather, focus on repurposing existing content into different formats and updating them in order to make it suitable for your target audience. Need help with any aspect of content strategy or content marketing? Talk to a HubSpot specialist at Prodigitas. Prodigitas enables modern marketers and business owners with enterprise grade marketing technology and consultation to enhance business growth and revenues.